I was introduced to the extraordinary, unearthly music of Gillian Welch by the novelist Kazuo Ishiguro in 2002. He was on Desert Island Discs and his last choice of song was ‘I’m Not Afraid To Die’ from the 1998 album Hell Among the Yearlings. There comes a stage in our lives when vanishingly few songs immediately breach the walls of taste we build around ourselves, but this was love at first listen. In the years since then, Welch and Rawlings have become towering figures on the folk/Americana scene, their songs have won Academy Awards, and their sound and musical vibe has been imitated across the world. Yet they have remained utterly true to themselves, producing a small number of CDs, each stark and pared back in their deceptively simple acoustic sound. They complement one another perfectly. Their voices are similar, like the Louvin Brothers and the Everlys, but with the small added strangeness of female and male voices singing in the same register. David Rawlings’ jagged, flat-picking guitar, always on the brink of atonality, adds grit and edge to the melodies. Their influences date back to the Depression but there is nothing nostalgic or phony about the songs. They are for now. There’s something mysterious about these songs. Where do they come from? The tunes are haunting, eerie. The lyrics conjure up their own world of loss and regret. I’ve always loved the opening lines of ‘Barroom Girls’ which, unusually, Gillian Welch wrote by herself. And fell at her feet in a beautiful mess. But then there’s something else going on in this story, a strange, untold story from the past that we can only guess at. Melancholy has a strange power in Gillian Welch’s songs. It is narcotic, seductive. ‘But, oh, ain’t the nighttime so lovely to see? Songs about depression can be depressing, but Gillian Welch’s dark turn of mind has a tug of humour to it. In the early days, before the world had become attuned to this music, notably through the score for the film O Brother Where Art Thou?, people used to complain that the songs were dirge-like. It’s a charge I have never truly understood: sadness in the right hands can be uplifting, life affirming. At the end of the song, the last two lines are repeated, with one clever, unsettling change to the lyrics. Blessed: it’s a great little turn of the wheel at the end of the song. 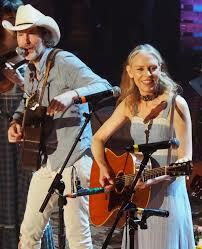 We are all blessed to be around when Gillian Welch and David Rawlings are writing and performing these superb songs.